Since starting my new job in the accounting field, I haven't had the opportunity to sit back and watch Tampa Bay Lightning games like I used to when I was writing at HockeyBuzz and finishing my degree. Living out West means that Tampa games are often midway through the second period by the time I get home and find my way to the couch. So, nights like last Tuesday night feel kind of special. I got home and was able to watch the Lightning play a very solid game against a quality opponent, the Detroit Red Wings. The result was a 6-2 win for the home team, which sent countless "fans" in red straight to the washroom where they could switch back to their blue-colored gear. Victory tasted especially sweet, if I may say so. One of the things that stuck out as I watched Tuesday's game was the play of Vladislav Namestnikov. I've written at length already about his impact on the Lightning this season here and here, so it didn't exactly surprise me when I found myself sitting back and thinking that the Bolts might have a real building block in the form of #90. What it did do, however, is get me interested in quantifying some of his very real success now that we basically have a season's worth of data to analyze. The results, as you'll see below, were more impressive than I ever could have predicted. Also reminder - 35+ points is 2nd line caliber in the NHL... 50+ points is 1st line. Where does Namestnikov fit in? He's right below that second line tier, which would suggest that he's an excellent third line forward at this point in his career. Based on that alone, it wouldn't be unreasonable to suggest that I'm getting way too excited about a guy who isn't producing at a top-six level; still, don't forget that this initial analysis is based simply on raw totals. 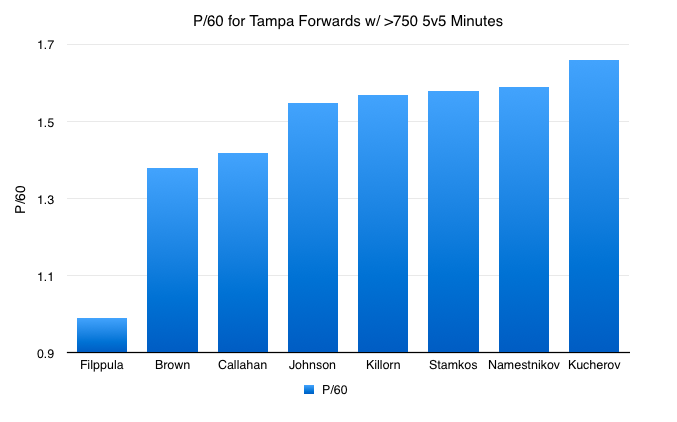 The underlying numbers suggest something far greater for Tampa's #90. 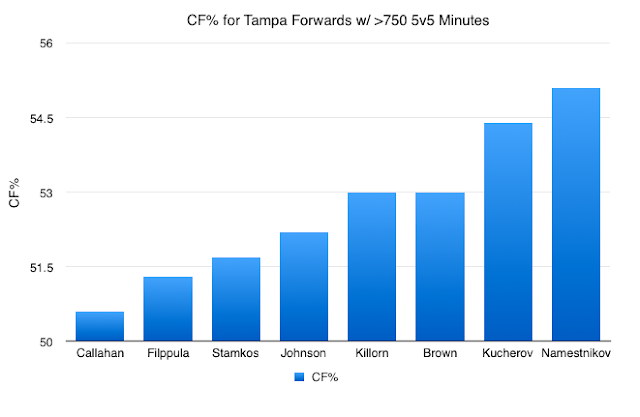 Beyond the raw number, only Victor Hedman (who was excluded from the above chart because he plays defense) has a better relative Corsi percentage than Namestnikov among all Tampa players who have suited up in that 750-plus minute club. And it goes even further beyond that. Per Puckalytics.com, 222 forwards have played at least 750 five-on-five minutes this season. Where does Namestnikov rank among those players in CF%? Not 100th. Not 50th. 24th. TWENTY-FOURTH. 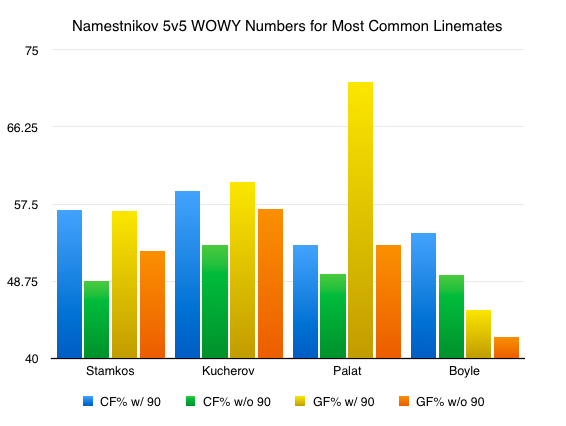 The bottom line: Namestnikov is driving possession like few other players in the league right now, which is sometimes difficult for young players to do. Possession and time in the offensive zone is a great thing, but it doesn't mean a whole lot if the puck doesn't find its way to the back of the net. If there are Namestnikov detractors out there (and I'd love to meet these mysterious people), that's probably the area they'd point to as a way to tear him down. As stated earlier, a 30-ish point season doesn't *sound* all that special on paper. But, again, context is everything. As an extreme example, remember that a guy who scores a goal for every minute of ice time while only receiving five minutes of ice time ends up with the same raw total as a guy who scores five goals in a season while playing every minute of every game. Context. It's not Stamkos sitting there in the second spot. It's not Tyler Johnson, either. It's Namestnikov. ....the list literally goes on and on. The guys on that list aren't chumps. Don't mistake Namestnikov's 115th place ranking for a negative attribute. Perhaps the best part about the offense Namestnikov is creating for the Lightning is the fact that he's been able to create it without giving up an ounce of defensive responsibility. In fact, he's been an elite defensive player for Tampa Bay this season in a league-wide context. Again among those 222 NHL forwards with more than 750 minutes played at five-on-five, Namestnikov ranks 11th (!) in CA/60 (number of shot attempts against per 60 minutes). That's elite defensive performance. When Namestnikov is on the ice, his opponent isn't sending the puck towards Tampa's net. Over time, that sort of performance starts to reflect itself on the scoreboard. It has with Namestnikov. His on-ice goals-for percentage (61%) ranks 30th among those 222 forwards. When he's on the ice, it's the Lightning scoring rather than the opposition. Players who can create that sort of dynamic when they are skating around are beyond valuable. Finally, and before signing off, I want to make one more point. One of the big narratives in both new-school hockey and old-school hockey is the idea that the best players make guys around them better. With-or-without-you numbers (WOWY) have been fantastic for completing this sort of analysis from a quantitative perspective, but we've been doing it for eons from a qualitative standpoint. We've known for years that the guy who plays with Daniel and Henrik Sedin will likely be alright, as an example. This chart is a mess, but what you want to see is blue higher than green and yellow higher than orange. In all cases, for Namestnikov's four most common forward linemates, blue is indeed higher than green and yellow is indeed higher than orange. Namestnikov makes those around him better, which is a really special quality for such a young player to have. In case you can't tell, I think Namestnikov is a special player. The fact that he's done all this in just his first full NHL season is nothing short of amazing, and it should get all Lightning fans excited about what the future might bring for this player. Guys like Kucherov, Johnson, and Hedman are often and rightly mentioned as must-sign guys in all the salary-cap-related banter that gets tossed around on Twitter. It might be time to add Namestnikov to that list.